ATLANTA – For years, vAuto’s Provision has provided dealers actionable insights on valuing consumer trade-ins, and thanks to a new integration with Manheim Express, they can now act even faster to list vehicles in the wholesale marketplace. As the first integration between two Cox Automotive mobile apps, this seamless connection brings dealers major efficiencies—making it easier and more cost effective than ever to wholesale vehicles. Of the approximately 450,000 trade-ins dealers evaluate each month with Provision, 50,000 end up in Manheim’s wholesale marketplace. The integration combines two mobile technologies, vAuto’s Provision app and Manheim Express, to help dealers list inventory for wholesale in minutes without having to transport a vehicle to auction—saving time and money. When vAuto dealers opt to wholesale a vehicle, the Manheim Express integration gives dealers an instant, real-money offer—called a Guaranteed First Bid—on that vehicle. With this feature, dealers can reduce their risk and quickly and confidently make good decisions during their appraisal and wholesale processes. Guaranteed First Bid, driven by rich valuation data from the Manheim Marketplace Report (MMR), sets a minimum floor price for a dealer’s vehicle. If the vehicle does not sell for the floor price, or higher, within two sale-days of being listed, Manheim will purchase the vehicle at the Guaranteed First Bid price . Dealers can now rest assured that they can quickly move unwanted vehicles off their balance sheets. 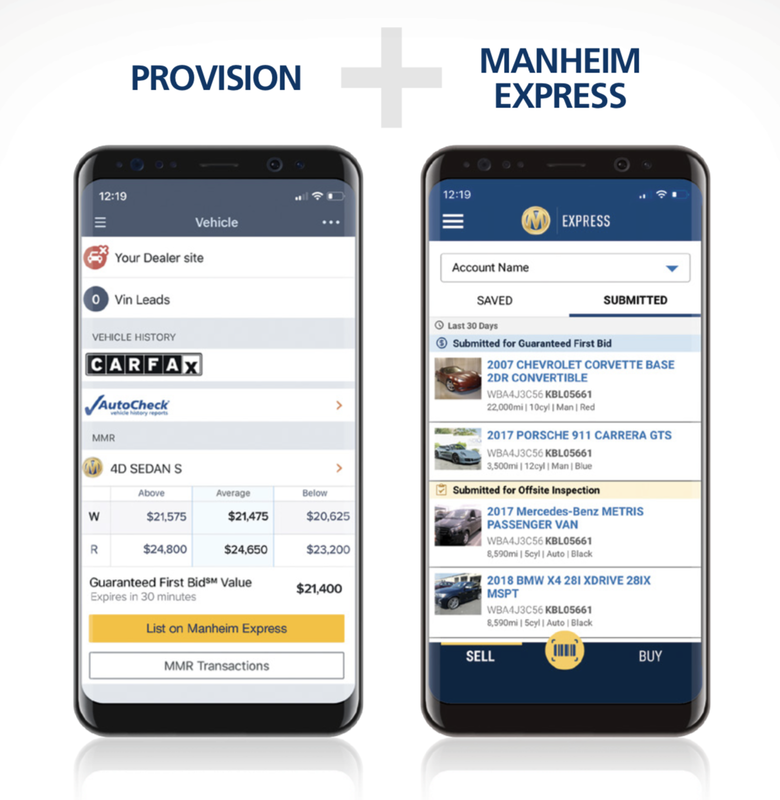 For more information about the Manheim Express integration with vAuto, visit ManheimExpress.com. vAuto® provides innovative technology, tools and business intelligence to thousands of dealerships across the United States and Canada, helping them compete more effectively and increase new/used vehicle sales volumes and profits. Founded in 2005, vAuto revolutionized dealers’ used vehicle operations with the groundbreaking Provision® suite of tools. Leveraging The Velocity Method of Management®, pioneered by vAuto founder, Dale Pollak, Provision helped dealers adopt a more transparent- and turn-focused approach to used vehicle acquisition, appraising, pricing and merchandising based on real-time, local market supply-and-demand data. In 2018, vAuto released the Provision ProfitTime metric and methodology to help dealers maximize inventory turn and gross profit based on the investment value or profit potential of each vehicle. The same year, the company expanded its integrations with Cox Automotive’s HomeNet and acquired iRecon, an online reconditioning workflow platform. The moves extend vAuto’s efficiency-focused used vehicle management solutions into vehicle merchandising and reconditioning. vAuto’s solutions also include Conquest, a new vehicle inventory management and pricing system, and Stockwave, which enables dealers to efficiently find and purchase vehicles from leading wholesale sources via a single platform. Headquartered near Chicago, Illinois, vAuto is a Cox Automotive™ brand.